A true pioneer, Ann McMillan was the first instructor to bring Pilates to the province of Québec when she opened the Centre Pilates de Montréal in 1992. She discovered Pilates while pursuing a dance career in New York City in the 80’s, and went on to complete her Master’s thesis in Exercise Science at the University of Montreal where she continues to lecture today. Her graduate work was the first to establish a scientific link between Pilates and improved dynamic posture in ballet dancers. She has trained numerous instructors in Quebec and abroad. Her lecture circuit takes her regularly across the United-States, Europe and Asia. 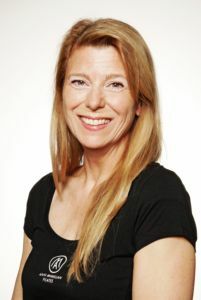 Being the province of Quebec’s pioneer Pilates instructor, she has regularly appeared in several French and English media since 1992. In recent years, professional athletes have also turned to Ann to help them hone their skills. Among them we find Olympic Gold Medalist Ice Dancer Tessa Virtue, Olympic Gold Medalist Mogul Skier Jennifer Heil, Olympic Gold Medalist Figure Skaters Jaime Salé and David Pelletier, Olympic Silver team medalist figure skater Kirsten Moore-Towers, Bronze Olympic Medalist Diver Jennifer Abel, Canadian Synchronised Swimming Duo Karine Thomas and Jacqueline Simoneau, Triathlete Kathy Tremblay, Gymnasts Victoria and Rose Woo and Boxing Champion Lucian Bute. Ann is thrilled to share her knowledge of Pilates with elite athletes. She started practicing Pilates in NY in 1986 where she completed her first teacher training program with Romana Kryzanowska in the early 90’s and also had the privilege to take sessions with Kathy Grant. Elizabeth Larkam has been a great source of inspiration since 1993. After completing her master’s thesis in 1996 she trained instructors for Polestar in eastern Canada. Responding to the demand for a complete French language Pilates teacher training program, Ann officially launched her own training program in 2003. In order to dedicate herself to teacher training and lecturing, Ann closed her studio, the Ann McMillan Pilates in September 2013. Thus liberated from the constraint of managing a business, Ann starts a new chapter in which she is free to explore the art and science of movement.